This one-woman show looks like a great idea on paper – a modern feminist spin on the entwining perspectives of William Shakespeare's creations and Elizabeth I's proud ascension to the throne. The gender battle lines are represented by a likeable young performer in the shape of Paula Blanco whose asides to the audience on the nature of acting and sexuality alike are occasionally witty and self-deprecating. Everything has been thrown at this production, including a magnificent brocade regal gown, and some power ballads in the background. But it fails to ignite and stays at one pace throughout, despite looking lovely with projected stained glass windows and evocative mood lighting. Sadly, too, the garbled lines of the monologue are frequently rushed to the point of incomprehension. 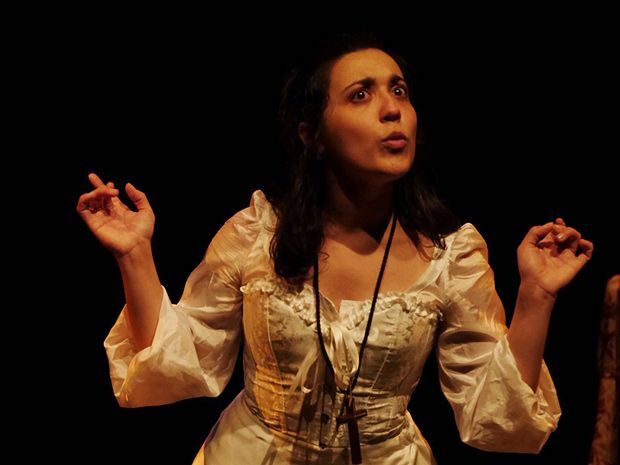 Blanco is a more interesting, less inhibited character when pretending to be Shakespeare than in her portrayal of Elizabeth, which rather defeats the purpose, as she suggests she penned Shakespeare's words here. An experimental tone is fine within the context of a more confident performance, but limitations are exposed, particularly when she attempts different regional accents, going from ribald Cockney to posh middle-Englander. A pity, as Blanco is clearly au fait with the Bard, and passionate about his oeuvre. More of her own meditations on performance and patriarchy would sharpen the quill. Paradise in The Vault, until 28 Aug, 5pm, £8 (£6).